Let me share a secret with you that you might not hear anywhere else: the legal industry isn’t perfect. One of the biggest issues lawyers are facing right now is, due to cost, more and more people are opting to represent themselves rather than seeking help from a professional. Avvo was created as an answer to this problem. The site is an online marketplace where clients can find legal help that fits their individual needs. 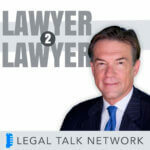 It’s Match.com for lawyers and clients, as CEO Mark Britton describes it. But the industry at large hasn’t exactly welcomed Avvo, or other companies like it, with open arms. On the contrary, Avvo was sued after only nine days of existence. In this report from TECHSHOW Today, hosts Dennis Kennedy and Steve Best talk to Mark about Avvo, why it works, and the issues it addresses that continue to plague the legal industry. From offering a broader array of services to using analytics to make business decisions, maybe Avvo shouldn’t scare lawyers as much as it influences them. He goes on to explain that Avvo was founded ten years ago based on the needs of both lawyers and consumers that weren’t being met. Lawyers needed business while customers needed legal help. Right away, the company met resistance via a lawsuit. But really, all the suit did was give Avvo press earlier than they would have experienced otherwise. “To effectuate any change you just have to push forward and push forward hard.” Mark says. Sure enough, aspects of Avvo now seem normalized, including their rating system and user-generated content. But as a company, it is still growing and investigating new features and content. “One of [Avvo’s] challenges today is how to continue to be innovative and push the conversation forward,” Mark says. Even after ten years of existence and with thousands of users, a number of legal professionals still don’t understand what Avvo is and how it operates. This ignorance often surprises Mark. “When it comes to the web there is a very real and big movement happening here that is largely being driven by your customers and yet you’re not familiar with it,” he observes. One of the biggest issues legal professionals currently face is the do-it-yourself mindset. Mark comments, “You have so many people that feel frozen out of the legal services supply chain.” This “freezing out” can cause potential clients to forgo legal aid altogether because they cannot afford it or cannot adjust services to fit their needs. In this situation, no one benefits. “Outside of the simplest legal transactions I would never advise anyone to take that road, but because they feel frozen out they’re going down that road,” Mark observes. Part of what has made Avvo successful is its production and use of data to improve their business. A lot of legal businesses, though, are intimidated by big data or don’t know where to start. To Mark, analyzing data is an important part of running a healthy business, whether large or small. And to do it successfully, you don’t even need a PhD or an analytics team. All you need an intern who knows how to use Excel and pivot tables. One of the problems, according to Mark, is that a lot of lawyers don’t see their practices as a business. The trick is recognizing a firm as a business and desiring to run it as you would any other business. “There is no way that you are going to run your business successfully without being a student to business principles,” Mark says. For more about Avvo, legal innovation, and data analytics, watch the full video below.